Plant mandevillas (Mandevilla spp.) anywhere you need to add a bright splash of color. This striking tropical plant, also commonly called dipladenia, grows as a tall vine or as a shrubby, compact plant depending on the cultivar you choose. Mandevillas can quickly grow tall enough to cover mailboxes, arbors and fences, while also making a show-stopping addition to a container garden. Although mandevillas are typically pest- and disease-free, you should periodically inspect the foliage to make sure there are no creepy-crawlies that need to be knocked off with a strong spray of water. When choosing a mandevilla to grow at home, consider the bloom and color as well as the plant’s size to find the variety that will be suit your garden. For example, Alice Du Pont mandevilla (Mandevilla splendens "Alice du Pont") grows 15 to 20 feet long, making it ideal for using with a large trellis, arbor or wall. It blooms in summer with icy pink flowers and it's hardy in U.S. Department of Agriculture plant hardiness zones 10 and 11. If you're growing the mandevilla in a hanging basket or a container, consider low-growing cultivars such as Strawberry Lemonade mandevilla (Mandevilla sanderi "MonProud") which has striking green and white foliage. It blooms with deep pink flowers from spring until the first frost and it's hardy in USDA zones 10 to 11. Another compact option, Vivian Vogue mandevilla (Mandevilla Vogue "Vivian") has brilliant pink flowers and grows 18 to 24 inches high and wide. This compact plant is hardy in USDA zones 9 to 11. Grow mandevillas in a sunny area with full to partial sun exposure. Ideally, select a spot that offers light shade during the hottest afternoon hours. Choose a planting location with well-drained soil. When you plant the mandevilla, work 2 to 4 inches of compost or other organic material into the soil to enrich it and provide extra nutrients to the plant. If you're growing it in a container, Clemson Cooperative Extension recommends mixing equal amounts of potting mix, peat moss and builder's sand. Space multiple plants 36 to 60 inches apart. Keep the soil evenly moist -- but not soggy -- during the growing season. Because mandevillas prefer plenty of moisture, check the soil every day or so to avoid allowing it to dry out. Fertilize plants every one to two weeks during the growing season. Use a high phosphorus 10-20-10 blend or fertilize the mandevilla with a balanced fertilizer, such as a 20-20-20 water-soluble formula, by mixing 1 tablespoon of fertilizer in each gallon of water. Prune mandevillas annually in early spring or late winter before the plants start showing signs of new growth. Cut it back up to 50 percent to keep the size in check. Also, remove any crowded stems or limbs that show signs of damage or disease. Pinch the stem tips on mandevilla plants during the growing season to encourage the plant to develop sturdy growth. Mandevillas can't tolerate temperatures lower than 45 to 50 degrees Fahrenheit. If you live in a cooler climate, you can grow mandevilla as an annual or overwinter the plant indoors, which works best for plants grown in containers. Cut it back to a manageable size for the space in your house and move the mandevilla to a shady outdoor spot for one to two weeks to start preparing it for the reduced amount of sunlight that it receives indoors. Place the mandevilla near a sunny, east-, west- or south-facing window in a room with temperatures of 60 to 65 degrees F.
Water it sparingly when the soil feels dry and give the pot a quarter turn every two to four weeks. Place the plant on a tray filled with gravel and water to prevent the drier indoor air from affecting the plants. 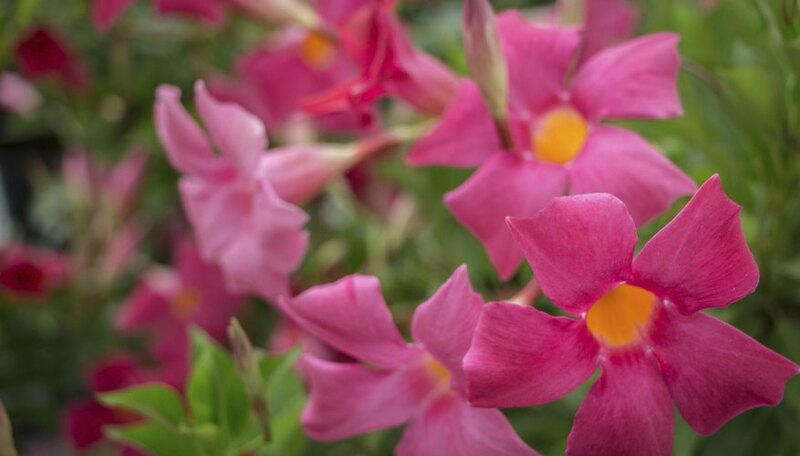 Three or four months before taking the mandevilla back outside, give it a light pruning and start fertilizing it monthly to restart the growing process.